Great News --- Joseph Bramlett is playing again! Editor's Note - Here's an update on rising junior Joseph Bramlett, 2006 2nd team All-American, who was injured for the last 7 months of last season. Although this blog is typically directly written by current players we'll make an exception this time by sharing the first hand experience of a former player. "Played with Joseph and his dad on Friday (July 25th). Joseph ("Pep") is working on his game, playing every day and playing well. His distance is still there, hitting it by my best by 50-60 yards... ! I saw several 310 -330 blasts and all I could say was, "Big deal, let's see you do it with persimmon and balata!" He said he is taking it easy and being quite careful about his wrist (I think he explained it as strained ligaments/tendons and small bone bruise) and doesn't want to put too much stress on it. He decided to withdraw his entry from the US Amateur because the wear and tear of that many rounds over a short period could prove detrimental to the healing process. 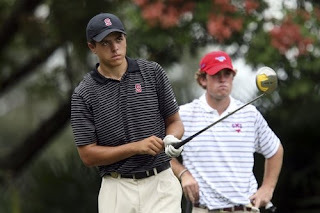 His spirits are high and he is looking forward to Stanford golf this fall."